5 Stars / Breakthrough The / du Maurier, Daphne / Science Fiction / Short Stories / Tuesday Terror! book review, daphne du maurier, horror, sci-fi, science fiction, The Breakthrough, tuesday terror! I’ve only ever read Jamaica Inn but The Breakthrough sounds interesting. Happy hibernation, Porpy! How cruel of you to let porpy ‘s dreams be fretful for so many months. But…I have had a BIG shock…I was sure that the snoozing porpy pictured was a young lady. Are you sure? Did you check the nether regions before so confidently saying HIS. Did you try the tempting with chocolate test? Wave a little square of it under the sleeping one ‘s nose. A girl porpy will surely awaken, little nose quivering, little mouth salivating, and, snap! Snap! (Mind your fingers) the little square will be gone. OH! Hang on, this is YOU we are talking about…no chance of little squares of chocolate making their ways into the porpy gender testing arena….okay, snooze on porpy, boy or girl, question unresolved. Well, the truth is that the porpy is gender fluid, but she was having a he day that day. She’s also species fluid! 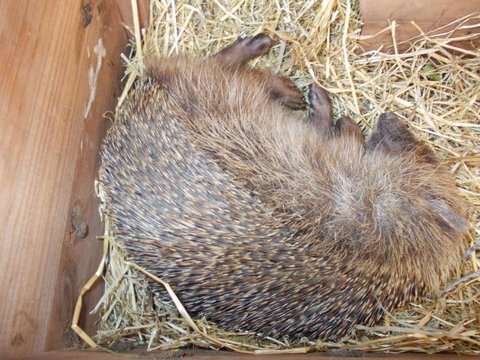 Usually he’s a porpentine but on that day she was a hedgehog impersonating a porpentine! I’m telling you it gets very confusing around here sometimes. Thank goodness T&T are neutered, though heaven only knows what that makes them! I assure you if the porpy attempts to steal my chocs he’ll be singing soprano whichever gender he happens to be that day!!! Wow! I didn’t know this story existed! Good on Daphne! Porpy is adorable rolled up like that. I had no idea Du Maurier had delved into science fiction. Of course, I’m no expert because I still haven’t read a book of hers, though I own a few, including a special edition of Rebecca I had to buy from Book Depository because I thought THAT would get me to finally read it. 😂 Lovely review, FF! Love seeing the porpy sleeping! Not my cup of tea, but perhaps the Porpy can get into it. He looks rather at peace in that photo, though, so it must not be too frightful! I’m going to miss the little guy. Sleeping all summer seems a tragic waste of warm, sunny days! 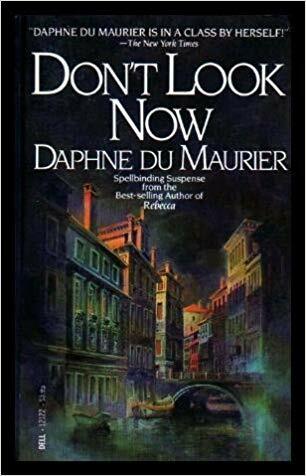 I have the Don’t Look Now collection so you’ve inspired me to dig it out and read this! It’s been decades since I read du Maurier & as you say, she’s a great storyteller. I just had a look, and this story is part of a du Maurier collection I got last year. I’m thinking it’s time I dip back into some of her books and stories! I’ve never heard of this story but loved your review so will seek it out. A bit confused about chocolate and coffee being allowed but alcohol off limits. Haha – I was surprised he didn’t walk out when he was denied whisky! He was certainly grumpy about it. Hope you manage to find a copy – it is available online if you do a google search, but I thought it was a bit long to read comfortably on a computer. Oh I didn’t realize you put the porpy down to hibernate in the summer, but that makes complete sense. I read rebecca and will be posting my review of it soon (spoiler: i loved it) so it doesn’t surprise me that this is a great story as well. And it’s a video review to boot! I read this story fairly recently and was very impressed with it. As you say, it raises so many questions about the nature of life and death. A very creepy and intriguing read. She’s really great at the short story format. I think I actually prefer her shorts to her novels, with the exception of the wonderful Rebecca. Oh yes, I found The Breakthrough hella creepy. Most of the stories in that collection are pretty dark and disturbing, if I remember correctly. I think I’ve only read the title story and this one. Don’t Look Now is great, though, and I love the film version of it too. Daphne du Maurier keeps popping up for me lately. Clearly, I need to read more of her. It’s fate! I think she’s having a bit of a moment on the blogosphere, as we all keep tempting each other with her books. I think I like her short stories even more than her novels. We are all terrible enablers on here!